Sourland Mountain Preserve is located on East Mountain Road in Hillsborough. Link to the Hiking trail map and description. You know you have a true friend when they don’t bail on your early Monday morning hike even though it is down pouring. I absolutely love hiking in the rain, there are so many different smells and sounds and it feels like you are in commune with the wild things. I get a similar feeling when night hiking – I am out of place but in the most delightful and adventurous way. We found a lot of mushrooms on this hike, and so I reached out to the marvelous Nina Burghardt, a distinguished mycologist and former president of the New Jersey Mycological society. I went on a Mushroom Foray that she lead for the Sourland Conservancy and was blown away by all the different types of Fungi and her wealth of knowledge. Nina graciously identified the mushrooms we saw and gave me some helpful information on how to identify them. An escargatoire! A nursery of slugs. Slugs are shell-less mollusks (phyllum Mollusca) in the class Gastropoda. Gastropods are the largest class in the phyllum Mollusca and perhaps the most diverse. Gastropods can be both aquatic as well as terrestrial and have some of the most intricate shells you have ever seen and some have shells that are pretty much non-existent! Black Gum, Nyssa sylvatica, bark. I love how bark looks like it fits together like puzzle pieces. Tree bark is not consistent through time, just like our skin. When we are young are skin is smooth and as we mature, so does it We develop our own furrows, ridges and creases that distinguish us and our stories from those who have not lived as long. This mushroom, Megacollybia rodmanii, reminds me of the iconic photo of Marilyn Monroe standing on the subway grate with her dress flying up all around her. I loved all the raised paths along this trail. Don’t get me wrong, I thoroughly enjoy scrambling over rocks but these raised paths make this trail a little more accessible to those who are not quite as nimble as they might have once been. Also, I think it just looks really pretty to see winding paths through the woods. Some of these raised paths were pretty far in and I can imagine how much time and effort it took those who built it to bring in all the wood and supplies. Imagine being a few miles in and then realized you left your hammer back in the car?! These fantastical orange mushrooms are, Pholiota limonella! Autocorrect changed the species name to limoncello, which obviously made me want a cocktail. The picture really doesn’t do the mushroom justice, it was spectacularly orange, in great contrast to the dark wet colors of the rain soaked forest. These mushrooms are saprophytic and work as decayers of organic matter. Little Toad! This is either an American Toad, Anaxyrus americanus or a Fowler’s Toad, Anaxyrus fowleri. I was informed by the trusty Sourland Stewards that these two species hybridize in our region. Japanese Barberry, Berberis thunbergii, creates a perfect habitat for black legged/deer ticks, Ixodes scapularis. Deer ticks are the vector for the bacterium, Borrelia burgdorferi, that causes Lymes disease. Japanese Barberry creates the perfect habitat for deer ticks to thrive, get their first meal and reproduce. This article from entomology today goes into more detail about the effects of this invasive plant on the increase of the deer tick population and increase of Lymes disease. Chanterelles, Cantharellus spp. Prior to going on a hike with Nina, I had never seen a chanterelle in the wild before. Now I see them EVERYWHERE! Someone lost an earring. I love the thoughtfulness of the finder to hang the earring up on the trail blaze, and I hope that the owner reunites with their lost item. Purpletoothed Polypore, Trichaptum biforme. The young mushrooms can be a brilliant violet color that fades as the fungi matures. Polypores are also hardworking saprophytes that decay hardwoods. We stood here scratching our heads over this tree. How did this happen? What is holding it down? The tree is still alive and there is nothing pining it down in this arch. Japanese Barberry, Berberis thunbergii, and Japanese Stiltgrass, Microstegium vimineum, invasion. Old Man of the Woods, Strobilomyces floccopus. I wonder why this mushroom was given this common name… This is a young Old Man of the Woods (hehe), but as they mature the cap starts to look like a perfectly scored loaf of fresh bread. A fly, Drosera spp. hanging out on the underside of a mushroom. Mimosa? I’d love one, thank you! Oh… the tree… right…. Mimosa (also called Persian Silk tree), Albizia julibrissin, is an invasive ornamental belonging to the bean family, Fabaceae. I learned about this plant during my undergraduate study and now I am obsessed with it. Mimosa has a really interesting response to stimulus, whether it be touch or sudden change in temperature. Turgor pressure is what gives plant cells structural stability, and this crafty plant is able to change that turgor pressure in the leaves, causing them to fold. This response is hypothesized as a way to protect the plant from herbivory and desiccation. Before you do anything else today, please watch this video! I promise it will be a very interesting 16 seconds of your life… and you should also watch the stronger response video too! I bet you won’t be able to contain yourself from tickling the next Mimosa you see! This entry was posted in Uncategorized on August 21, 2018 by Carolyn. Cedar Ridge Preserve is located on Van Dyke Rd in Hopewell NJ. Link to NJ Trails hike map and description. Goldenrod, Solidago canadensis. This flower is the first sign of the autumnal season for me. It is a little darker when I wake up in the morning and the air has a slight chill to it. Lately I have been challenging myself more to try to identify more new plants. For awhile I had reached saturation level, and would see a plant I didn’t recognize and be able to say “Hmmm… don’t know that one” and walk on. Now, I am on an all out plant-blitz, trying to figure out everything I don’t know (except grasses, rushes and sedges… those I will still happily “Hmmm… I don’t know” and walk on). I have been reaching out to friends, former colleagues and even new acquaintances (hopefully soon to be friends!) and playing “Name that plant!”. My good friend Julia Perzley, soon to be Dr. Julia Perzley (Go Julia! ), has been a major contestant in this game and I wanted to give her a shout-out as a meadow forb wizard! Heal-all, Prunella vulgaris, a native flower belonging to the Mint Family. I surmise from the name that this plant was used in traditional medicine. I love that I have been working in ecology for 11 years, and on a weekly basis I can go out for a hike and consistently see plants that I have never noticed before. Queen Ann’s Lace, Daucus carota, with the “blood drop”. While the story of a drop of blood dropping on this flower is quite the folk lore, in all actuality this red spot acts as a homing beacon to pollinators! A spider’s net that has caught nothing but dew. I love hiking after/during a light rain or early on a dewy morning because you can see all of the stunning spider webs! This native purple beauty is called New York Ironweed, Vernonia noveboracensis. I daydream of having a front garden with flowers this color… I think I am going to have spend some time this winter researching seed sources for some of these lovely flowers! Agrimony, Agrimonia parviflora. 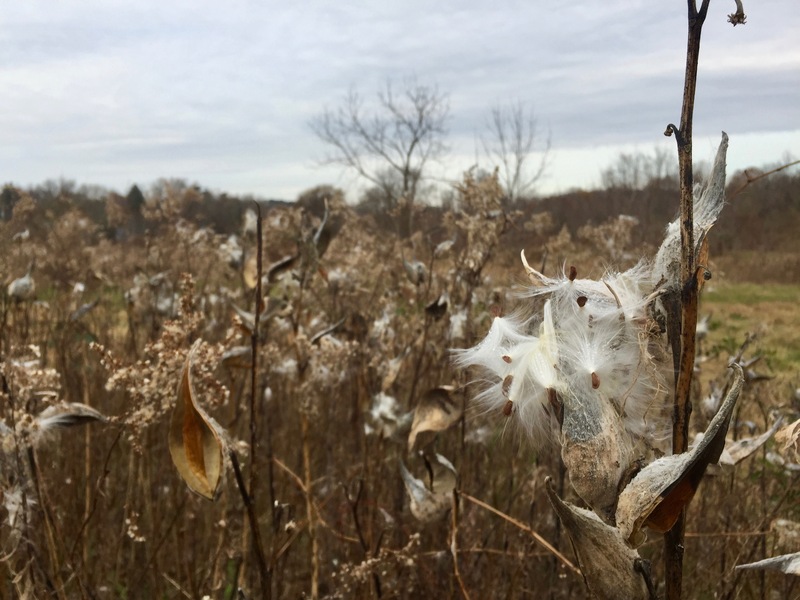 I reached out to one of our fabulous volunteers Pat Coleman, who works both as a Pennsylvania Master Naturalist Instructor and a Bowman’s Hill Wildflower preserve volunteer naturalist. A truly lovely lady with a ton of wisdom! A common name for Agrimony is “fairy’s wand” and in folk lore it was used to ward off witches! Eastern Tiger Swallowtail, Papilio glaucus, on Joe Pye Weed, Eutrochium purpureum. Joe Pye Weed is an excellent choice if you want to attract a plethora of butterflies! Monarch Butterflies, Danaus plexippus, on Milkweed, Asclepias syriaca. Here is a link to the National Wildlife Federations webpage about Monarchs. A little bench in the woods overlooking a stream. What a wonderful spot to sit and ponder, or perhaps write a poem? A massive Momma spider protecting her egg sack and itty bitty baby spiders. I really wasn’t sure what kind of spider this was and I asked around and the consensus is a wolf spider, family Lycosidae. I have never seen a spider quite this large on the East Coast. When I worked in the Mojave Desert I would regularly see Tarentulas, particularly in November during their breeding season. If you think this is some other type of spider, I would love to know what you think it is! Grapes, Vitis spp.! This is most likely River grape, Vitis riparia. It was growing very close to the stream bank and the leaves look very similar to river grape, however I am not 100%. In the past, I have only ever identified grapes to their genus and this is my first exploration into the different species of grape. I think this is a Fiery Skipper, Hylephila phyleus. I really am not any sort of entomologist, and I will not tell a lie that I hope it is a Fiery Skipper because I think that is the most amazing moth name I have ever heard! This is also a new-to-me plant. I believe this to be Water Hemlock, Cicuta maculata. From what I have been reading, it is one of the MOST toxic plants in the United States. I was giving myself an anxiety attack (yikes!) from reading into this plant and learning how toxic it is! Here is an article about how to identify it. What a lovely place to stop and enjoy the woods! I could just imagine relaxing in those chairs with my husband and watching my boys play in the stream. Burdock, Arctium minus, an invasive with beautiful flowers and annoying burs! There were a bunch of little fish swimming around in this deeper area. I should have brought along my fishing pole! Chanterelles, Cantharellus spp.! I love that they look like little gold nuggets thrown across the forest floor. I have no clue what this mushroom is, but I think it looked fabulous and wanted to snap a photo. Yarrow, Achillea millefolium, without flower petals. I love that they look like little pinecones on sticks. Death in the Sourlands… I think this little one is a Mole, family Talpidae. Moles spend most of their time underground and have very poorly developed eyes. I couldn’t find too much information on Moles, such as what species this might be, just a handful of general articles (here is one to peruse). Most of the articles I found were for pest control…. A Red Milkweed Beetle, Tetraopes tetraophthalmus, on a Milkweed, Asclepias syriaca, seed pod. I love that this little beetle is orange and black just like a monarch… hmmmm…. coincidence? Probably not! Many insects have color patterns that warn predators that they are toxic and to stay away. What a wonderful thing nature is! This entry was posted in Uncategorized on August 9, 2018 by Carolyn. A picturesque Friday morning in July. When I am inside, light and temperature are fairly constant and very predictable. It can also be changed by a flick of a light switch, a closing of blind, an increase or decrease of a thermostat. When you are outside and the temperature and light are perfect it is so much more satisfying than when you are inside. When you are outside and this perfection encloses you, it feels like the whole universe is welcoming you and beckoning you to explore. I will admit that I was hurried and frazzled upon arriving at our meeting spot but once I stopped and took a breathe and saw what a beautiful morning it was, I calmed down and relaxed. This was going to be a fun morning of wandering around looking for plants and enjoying engaging conversation about ecology. I was running late this morning and so I didn’t have a chance to eat breakfast before meeting up with my friends. As we hiked into the woods I was more than delighted to pick wineberries, Rubus phoenicolasius, and blackberries, Rubus allegheniensis, and add them to my yogurt. Truth be told yogurt is not exactly the nicest to eat while walking, but when you’re running late, you gotta do what you gotta do! Please gaze upon the beauty of Black Cohosh, Actaea racemosa, flowers. For real, can you believe that these are natives that are just so spectacular that they put out these enormous inflorescences in the middle of the woods??? Spicebush, Lindera benzoin, berries! When they ripen they will turn a bright red and apparently can be used instead of allspice! Here is a post by a forager about how to harvest and use Spicebush. Yellow Toadflax (or my preferred name: Butter-and-eggs! ), Linaria vulgaris, an invasive but oh-so-pretty field weed. One Butter-and eggs plant can produce up to 30,000 seeds per year… needless to say, these plants are hard to get rid of once they become established! Foxglove Beardtongue, Penstemon digitalis, a native flower loved by many different types of pollinators. Foxglove beadtongue also a unique characteristic called a “nectar guide”, which are lines that run along the inside of the tubular flower, guiding pollinators to the back of the flower where the nectar is held. Read more about it here! At the top of Baldpate mountain. On my birthday for the past few years I have woken up early, picked up a bagel and had myself a picnic then headed into the woods for a solo hike. I love bagels… I love Badlpate… Its a great way to start another year of living! Even if you aren’t up for a big hike, just parking and hiking up this hill and having a picnic is a great way to get some fresh air and enjoy the view! American Germander, Teucrium canadense, another mint family (Lamiaceae) native! A bumble bee, Bombus spp., on a Wild Bergamot (also known as Bee Balm), Monarda fistulosa. Wild Bergamot is in the mint family (Lamiaceae) and has mint scented leaves that can be used to make tea. This gorgeous flower is native to the United States, can tolerate a range of soil conditions and is attractive to bees and hummingbirds alike! An Eastern Tiger Swallowtail, Papilio glaucus, enjoying some Wild Bergamot! A beautiful pollinator habitat. Supporting pollinators with native plants can create an absolutely stunning landscape. Who wouldn’t want to look out their backyard and see this? A Scarlet Tanager, Piranga olivacea!!! I am not a birder by any means, but I was SO excited to see this bird! I first saw the red on a tree out of the corner of my eye and thought it was a trail blaze and then quickly realized it was a bird. The scarlet tanager is greatly impacted by habitat fragmentation because they are considered “interior” birds. The Sourland Mountain region hosts the largest contiguous forest in central NJ and provides critical habitat for these birds and many other plant and animal species. Here is a handout for land owners on how to improve habitat for the scarlet tanager! European chestnut, Castanea sativa, and Chinese chestnut, Castanea mollissima, leaves. American chestnuts, Castanea dentata, was once a dominant tree species in the United States and has since been mostly wiped out from the Chestnut blight, Cryphonectria parasitica, which is a fungal disease that attacks the vascular cambium layer of the tree and cutting off the flow of nutrients within the plant. There is large push to try to breed resistance into American Chestnuts to make them resistant to this blight (the European chestnut is susceptible to the chestnut blight, however the Chinese chestnut is not). On October 12, my dear friend and I will be giving a talk titled “American Roots” on the history of the American Chestnut and the efforts that are being made to bring this iconic species back to American forests. There will be history, science and music – a night of lots of fun! Make sure to check out the Sourland Conservancy’s website and the Facebook page for updates about registration. A sea urchin in the Sourlands!!!! Just kidding 🙂 This is a Chinese Chestnut, Castanea mollissima, bur. The burs open to reveal the nuts when they are ripe. Be careful, they are super sharp! This entry was posted in Uncategorized on August 1, 2018 by Carolyn.